Relax the mind and body with the Cowshed Knackered Cow Relaxing Bath & Shower Gel; a calming bath soak and body wash that seeks to soothe the feeling of tired muscles, whilst providing a gentle yet effective cleanse. The bath and shower gel can be poured under running water for an unwinding soak in the bath, or can be massaged into the body to eliminate dirt and impurities. Enriched with a skin-loving blend of Lavender and Eucalyptus Essential Oils, the formula has a soothing effect and a therapeutic fragrance that envelops the body in a veil of relaxation. 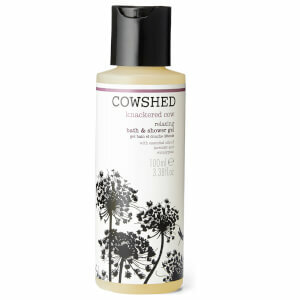 The bath and shower gel leaves skin cleansed, calm and comfortable, whilst encouraging a good night’s sleep. 100% Vegetarian. Not tested on animals. Made in England.